In Summer, a few miles from epicentre. Opening 3 songs from the last row of the balcony – I don’t own any of this content – all Glory Honor and Praise to HIM. Records’ Eric Church will release a 17-track live album, Caught In The Act: Live, on Tuesday, April 9, 2013 featuring songs from Sinners Like Me, Carolina, and his CMA Award-winning 2011 release, CHIEF. 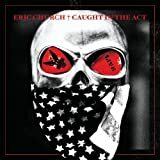 Caught In The Act: Live features raw, electric performances of songs like Pledge Allegiance To The Hag, Smoke A Little Smoke, How Bout You, Creepin and more. The release of Caught In The Act: Live is fans first chance to take home a copy of Church s live show, the only of the country genre to be named Best Concerts Of 2012 by The New York Times who calls it, A mean show, and adds, Mr. Church has clawed his way into the country mainstream with a series of post-outlaw anthems, and delivered them with verve and tension, as if he might not be allowed to for much longer. Live convert at the Rock Church San Diego August 12th 2013. Us in the city tram – just a few seconds after the Earthquake happened and some buildings crashed right beside us.